Whether you're ordering promotional items in bulk or creating custom shirts for an event, we have you covered. 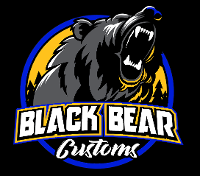 At Black Bear Customs, we work directly with commercial clients on a contract basis, along with walk-in customers in need of printing or embroidery services in Grafton, WV. We work directly with print shops and businesses that market themselves as printing companies with the goal of providing a comprehensive service that meets all of their needs. Simply email us with your graphics, desired items, and dropship details and we'll have it fulfilled within seven business days. Once complete, you're welcome to pick up your order at our location or have your items shipped to you. Though we typically print 100 pieces or more for our contract clients, we're happy to fulfill orders of 40 to 50 pieces as well. For our contract clients, we take the finished design you've presented to us and turn it into shirts, signage, decals, banners, or other promotional items. Before we get started, we make sure you have your complete design ready to go. Then, we explain the logistics of our design process, including what you should expect from your order and delivery. In addition to working with customers on a contract basis, we gladly accept walk-in clients. If you're walking in without a contract, we go through the entire design process with you. First, we sit down and get a feel for your project and what you're looking for. From there, we walk you through every step of the design process, from original concept to completion. With several artistically gifted designers on staff — including a graphic designer — we capture your ideas and bring them to life. We have thousands of models of shirts to browse, as well as a fully stocked showroom where you can choose colors, sizes, materials, and more. Contact us today for more on our printing and embroidery services.